In the United states malignant brain tumors are the second most common cause of cancer related death in individuals up to age 34, and the third most common cause in males up to age 54 (American Brain Tumor Association, 1992). Each year over 40,000 patients are diagnosed as having brain tumors (Hill et al., 2013). Among children, 2.5 to 4 per 100,000 become afflicted yearly (Packer, 2013). According to Packer (2013, p. 421), "tumors of the nervous system are the most common form of childhood malignancy and the leading cause of cancer-related morbidity and mortality." 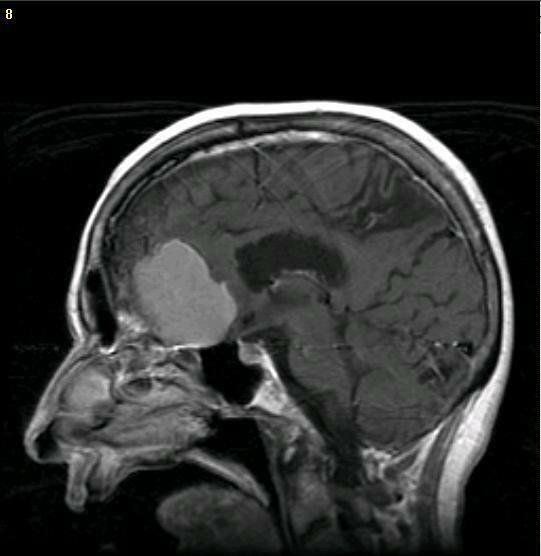 Brain tumors have a number of originating etiologies and may arise following head injury, viral or bacterial infection, metabolic and other systematic diseases, and are associated with exposure to toxins and radiation, as well as genetic abnormalities (Blumenthal, et al., 2013; Hill et al., 2013; Shapiro, 2013). Some are due to tumors that developed in other parts of the body and which metastasized to the brain. Yet others are believed to have originated in embryonic cells left in the brain during development (Burger & Scheithauer, 1994). In some cases tumors are a consequence of embyrological timing and migration errors. That is, if germ layers differentiate too rapidly or if cells migrate to the wrong location, they exert neoplastic influences within their unnatural environment. These are a primary cause of congenital tumors. Among children, many tumors are congenital developing from displaced embyronic cells, dysplasia of developing structures, and/or due to the altered development of primitive cells which normally act as precursors to neurons and glia. Most of these "congenital" tumors tend to occur within the brainstem, cerebellum, midline structures, including the third ventricle and cervical-medullary junction (Burger & Scheithauer, 1994; Robertson et al. 1994). Among older individuals, most tumors are due to dedifferentiation of adult elements. However, in both adults and children, the possibility of environmental factors as causative agents, that is, tumors as due to poisoning of the environment, is seen as increasingly likely. For example, the incidence of tumors have increased over the last two decades (Packer, 2013). Among children the incidence has increased by 35% (Smith et al., 1988). In fact, not just tumors, but an exceedingly high rate of secondary cancers have also been reported, especially among those younger than 3 (Duffner et al., 1998); which again raises the possibility of environmental factors as a causative agent. In the case of children (and many older adults) tumors are thought to be secondary to mutations and abnormal expression of developmental genes (Hill et al., 2013). Tumors are sometimes believed to be due to a loss of restraint in regard to cellular growth and differentiation such that a malignant progression ensues (Kim et al. 1994; Modrich, 1994; Sancar 1994). In large part this is believed to be due to the loss or inactivation of tumor suppressor genes (Hill et al., 2013), and/or the abnormal presence of an enzyme referred to as telomerase (see below), and/or the loss of regulatory proteins (produced by oncogenes) which normally control cellular growth (Gilbert 2003; Marx 1994; Shapiro, 2009). For example, the aberrant expression (or inhibition) of oncogenese are associated with cancer causing abnormalities in chromosomal structure. If these oncogenese becomes abnormal or are inappropriately expressed, they in turn induce malignant cellular formation. Presumably there are three groups of chromosomal abnormalities associated with altered oncogene expression, deletions, duplications and abnormal reciprocal translocations. For example, depletions are associated with the removal of the constraints normally exerted on oncogenese thus promoting malignant expression through the rapid and abnormal proliferation of cells as well as the possible loss of chromosomes during cell division (Rowley, 2003; Unis, 2003; Shapiro, 2009). Deletions are associated with the development of neuroblastomas in children (Gilbert et al. 1984). Duplications are associated with the transposition, amplification and hyperactivation of oncogenes (Alitalo, et al. 2003), such that numerical abnormalities in chromosomal expression result as well as segragational errors involving the gain of chromosomes during cell division (Shapiro, 2009). Again, this is presumed to be secondary to a loss of regulatory restraint. Hence, if there is a malignant recessive gene present, its duplication may results in a malignant overrepresentation and thus the expression of recessive malignant traits. The ability to suppress its expression has been overridden and a malignant hybrid cell is developed (Modrich 1994; Shapiro, 2009). As per oncogenes and translocation errors, it is believed that when two chromosomes abnormally exchange segments, there is a shift in the oncogene's position which results in its activation as well as the creation of abnormal fusion proteins. This again results in a series of replication and recombination errors that under normal conditions, are corrected (Modrich 2004; Sancar 2014). These translocation errors in turn produce base pairing abnormalities within the DNA helix -which violate the "Watson-Crick" pairing rules by creating unpaired bases within the helix. Normally, the "cellular mismatch repair system" recognizes these mismatches and eliminates them from the newly synthesized strands of DNA (Modrich 1994). That is, they normally act to insure genetic stability by removing the damaged nucleotide by replacing it with a normal base by inserting a complementary strand as a template; i.e. the duplex normally contains redundant information which can be reinserted when errors occur (Sancar 1994). However, due to these uncorrected errors, the cells mutate and begin to accrue additional mutations at rates hundreds of times that of normal cells (Modrich 1994), thus resulting in uncontrolled proliferation. As noted, tumor suppressor genes are frequently implicated in tumor pathogenesis. For example, mutations of a tumor suppressor gene, p53, which is located on chromosome 17p, have been reported in approximately 40% of cases involving astrocytic tumors (Hill et al., 2013) --tumors which are common in young adults. Yet another abnormal tumor suppressor gene, associated with high grade astrocytomas, is CDKN2, located on chromosome 9p. This latter abnormality appears to be due to deletions during chromosomal exchange. Likewise abnormal deletions involving chromosome 10 have been repeatedly associated with tumor development--which is significant as chromosome 10 contains multiple tumor suppressor genes (Hill et al., 2013). Specifically, these deletions appear to to result in a loss of proteins which normally act to inhibit cell growth and proliferation. That is, there is a failure to produce cell growth suppressor proteins--proteins which act to coat the DNA so that it is not coded and expressed. In the absence of these proteins, the nucleotide sequence segments associated with cell growth and proliferation, continue to be activated thereby giving rise to abnormal cellular development; i.e. tumors. It has also been recently determined that a specific enzyme, telomerase, may be a crucial factor in unchecked tumor growth and proliferation (Kim et al. 1994). For example, mammalian cells (but not microorganisms) typically have a finite lifetime, and are able to replicate about 60 times before simply dying. 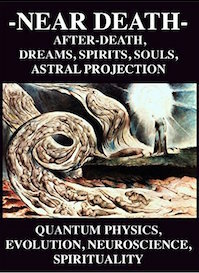 Cell death, in part is believed to be due to the progressive loss of their DNA; i.e. the erosion of the chromosomal structure, the telomere. Specifically, telomeres appear as the ends of chromosomes and consist of thousands of repeats of the sequence TTAGGG and related proteins (reviewed in Kim et al. 1994). Telomeres presumably aid in the positioning, replication and protection of chromosomes. However, normally chromosomes will lose from between 50 to 200 nucleotides per cell division of the telomeric sequence, which results in the net loss and shortening of the telomeres. Since the telomere supposedly acts as a "mitotic clock by which cells count their divisions" (see Kim et al. 1994), the net loss of these DNA fragments may eventually signal that replication has come to an end which results in cell death. Conversely it is believed that "immortal cells" and certain microorganisms continue to replicate due to the presence of a ribonucleoprotein "telomerase" which acts to synthesize and possibly replace these DNA fragments, the telomere. Because the telomere is resynthesized this enables the cell (and its DNA) to live on indefinitely. Similarly, human tumor cells have been recently discovered to also contain telomerase (Kim et al. 1994). Hence, like other "immortal cells" they too may grow and proliferate, presumably indefinitely, thus giving rise to abnormal cellular development and growth which in turn becomes cancerous. However, once a primary tumor begins to develop there are a series of secondary events which contribute to their growth, invasive properties, and metastasis. For a tumor to grow it must become vascularized. It has been suspected that tumors may in fact secrete a substance which potentiates capillary development (Sherbet, 2012). Hence, the initial stages of tumor growth are sometimes associated with increased blood flow and local hyperemia. Nevertheless, established tumors have a blood flow which is lower and more variable than surrounding normal brain tissue (Blasberg et al. 1981; Brooks et al. 2009). In fact, tumors have a lower oxygen utilization as well (Ito et al. 2012). Hence, tumors, or at least their central most portions, often exist in a state of hypoxia, although the oxygen they receive seems adequate for their peripheral proliferation and metabolism. In consequence many tumors, particularly those which are rapidly growing, contain central regions of necrosis due to its reduced reception of oxygen. As the tumor volume increases the surface area becomes increasing inadequate in regard to blood perfusion and the diffusion of nutrients and metabolic products, such that as the periphery proliferates, cells in the center become increasingly deprived of nutrients and undergo death and necrosis (Sherbet, 2012). Subsequently, underlying, normal tissue is also destroyed. As tumors grow they increasingly encompass, surround, and destroy neighboring tissue. Invasion also sometimes occurs by the locomotive behavior of individual tumor cells which develop microfilaments. These microfilaments extend into the cytoplasm of surrounding tissue and then infiltrate them, dragging the tumor behind them. When a tumor becomes vascularized its potential to spread is increased due to tumor material escaping into the blood stream. Capillaries offer little resistance to invading tumors which destroy the endothelium of the vessel walls. Hence, these vessels may also become hemorrhagic. Once tumor cells enter the blood stream they may be carried short- or long distances where they lodge and give rise to secondary growths. That is, like a thrombus they will attach to the vessel wall. Moreover, imperfections in the endothelial wall increases the likelihood of adhesion. However, unlike a thrombus or embolus these tumors cells are able to penetrate the vessel walls so as to form attachments to new host material (Sherbet, 2012). Anticoagulants, including aspirin, have been found to arrest or reduce the development of certain blood vessel borne tumor cell colonies (Sherbet, 2012). Tumors cells are also transported via the lymphatic system. It has been estimated that anywhere from 10-33% of all cancers located in other body regions will metastasize to the brain (Adams & Victor, 2013; Bloom, 2009; Hirsh et al. 2009; Sherbet, 2012; Williams, 2009). These metastases may be single or multiple. In the majority of the cases the patient has lung cancer whereas in other instances breast cancer is the culprit (Bloom, 2009; Hirsh et al., 2009; Williams, 2009). These metastasis are usually passed via the blood or lymphatic system. However, surgery for tumor often results in the development of cerebral metastases, presumably due to the dislodgement of tumor fragments which are then carried elsewhere. Intracranial metastases (or, carcinomas) are of three types, those which attach to the skull, those which metastasize to the meninges, and those which infiltrate the brain. 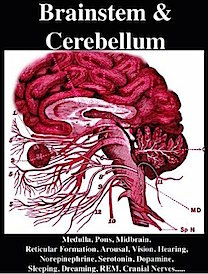 Most form in the cerebral hemispheres (60%) and the cerebellum (30%) and seem to develop preferentially along the distribution of the middle cerebral artery (Bloom, 2009; Burger & Scheithauer, 1994). In more than 70% of reported cases the metastases are multiple and scattered throughout the brain, usually near the surface in the gray and subcortical white matter. Malignancy refers the the biological ability of a group of cells to become freed of hemeostatic controls. When this occurs they progressively divide, spread, invade, and form distant metasteses so as to eventually kill the host. 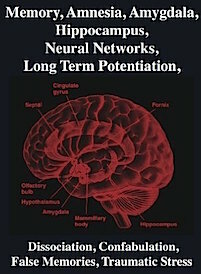 However, in addition to its infiltrative and proliferative potential, a tumors malignancy is dependent on its anatomic location, the degree of elevated intracranial pressure it induces, the patients age and neurological status, and its responsiveness to therapy (Mason, et al., 1998; Salcman & Kaplan, 2009). In contrast, so called "benign" tumors are slow growing, generally encapsulated, localized, with little metastatic potential. Realistically, however, all tumors have the potential to kill the patient and thus all are potentially malignant (Salcman & Kaplan, 2009; Sherbet, 2012). For example, a so-called benign tumor which is located in the brainstem, or a low grade astrocytoma located near vital centers may quickly kill the patient. Moreover, a tumor which is recurrent and ineradicable, albeit "benign", is just as fatal as a "malignant" tumor due to the effects of pressure within limited cranial-cerbral space; although they are not considered malignant, rarely metastasize and may in fact be relatively small. Hence, the grading of a tumor or its malignancy vs. benign state must be treated with caution (Salcman & Kaplan, 2009). Some tumors, however, may initially appear to be benign and receive a low grade, whereas as they grow they become progressively less differentiated, more malignant, and increase their metastic potential (Sherbet, 2012). For example, the daughter cells of transformed astrocytes, oligodendrocites, microgliocytes or ependymocytes, tend to become variably dedifferentiated, and thus more maligant as the tumor grows and cells devide and proliferate. Hence, what was a benign grade 1 astrocytoma is now a grade 4 glioblastoma multiforme. There is a bimodal age distribution regarding the development and incidence of brain tumors as they tend to occur in childhood and then later with increasing risk during the 5th, 6th and 7th decades, until a decline occurs during the 8th decade (Salcman & Kaplan, 2009). As noted, the incidence of tumors in children has increased by 35% over the last two decades (Packer, 2013). Gliomas, pituitary adenomas, and meningiomas are the most frequently occurring types of brian tumor across all age groups (Salcman & Kaplan, 2009). However, whereas meningiomas and gliomas are most frequent around 50 years, ependymomas of the 4th ventricle, pinealomas, cerebellar astroycytomas, and medulloblastomas are most common among those younger than age 20 (Burger & Scheithauer, 1994; Packer, 2013). 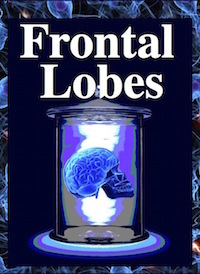 Medulloblastomas arise predominantly in the posterior fossa, and in the case of pinealomas (as the name implies) in the vicinity of the pineal gland. Medulloblastomas in particular are most frequently observed in children between the ages of 3 and 5. Unfortunately once detected, these tumors have usually infiltrated much of the central nervous system. In consequence these children have a very low survival rate. However, those whose tumors are detected before age 3, have a higher survival rate and can often be successfully treated with chemotherapy (Mason, et al., 1998). Over half of all childhood tumors, however, are low grade glial tumors. These are also common in the posterior fossa, as well as in the diencephalon. These two can be successfully treated with chemotherapy (Mason et al., 1998). 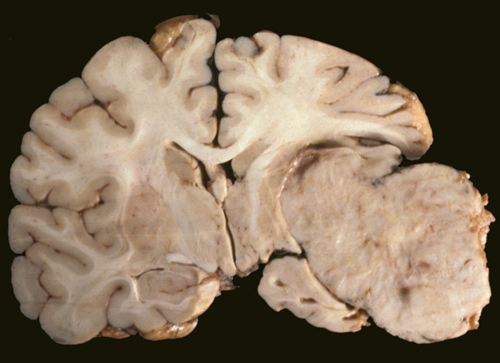 Broadly, most cerebral tumors can be considered as either intracerebral (intrinsic), or extracerebral (extrinsic). Extrinsic tumors usually arise from the coverings of the brain and cranial nerves and although benign, can exert compression on underlying structures. These include meningiomas, acoustic schwannomas, and pituitary adenomas. Intrinsic tumors are often secondary to the dedifferentiation of glia, ependymal cells and astrocytes. These include ependymomas, various grades of astroyctoma, and oligodendrogliomas all of which (particulalry gliomas) arise from adult elements. These tumors have the capability of becoming increasingly less well differentiated and more malignant. Frequently they involve the lateral portions of the hemispheres or the ventricles. Initially, tumor development is associated with localized cerebral displacement, compression, edema and regional swelling, particularly in the white matter. Because of this, although there are a variety of tumors (discussed below), the symptoms produced are more dependent on the tumors rate and location of development rather than the type tumor per se. Their influences are site specific such that initial localized effects are the most prominent. Hence, the commonest modes of onset include progressive focal symptoms, e.g. focal epilepsy, monoplegia, hemiplegia, aphasia, cerebellar deficiency, and symptoms of increased intracranial pressure. Most patients also suffer from periodic bifrontal and bioccipital headaches which awaken the patient at night, or are present upon waking. Vomiting, mental torpor, unsteady gait, sphincter incontinence, and papilledema are also frequent sequela (Adams & Victor 2013). 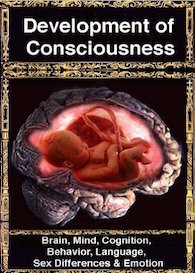 Nevertheless, as intracranial pressure increases disturbances of consciousness, cognition, and neurological functioning become progressively more widespread. However, generalized symptoms occur late, or not at all. Even so, functional disruptions associated with tumor formation are usually slow to appear and develop, taking months or years. 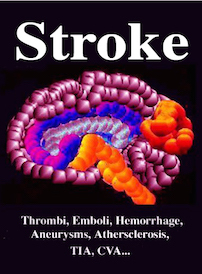 The sudden appearance of symptoms is generally indicative of vascular disease. However, in some cases a silent slow growing tumor may hemorrhage, in which case the symptoms are of sudden onset. A tumor may appear, develop and in fact grow for long time periods without hardly any symptoms. This is particularly true of slow growing tumors which give the brain time to adjust. Rapidly growing tumors exert more drastic effects. In this regard, a tumor which takes three years to reach a size of 5 cm, may exert little disruptive influences, whereas a rapidly growing tumor which reaches a size of 2 cm may exert profound consequences, even if localized to the same region. However, tumor location is also of importance, for even tiny tumors of the brainstem may cause death. Because of limitations in cranial-cerebral space, when tumors (or any mass lesion) form intracranial pressure is likely to rise. As intracranial pressure increases disturbances of consciousness, cognition, and neurological functioning become increasingly diffuse and progressively more widespread. This is because the skull is rigid and the development and enlargement of any type of neoplasm or space occupying mass (such as a hematoma or hemorrhage) occurs at the expense of the brain which becomes increasingly compressed. Hence, generalized symptoms begin to replace or at least override localized deficits as the tumor enlarges and spreads. Moreover, a tumor growing in one part of the brain will not only displace underlying brain tissue, but can compress local blood vessels as well as decrease the amount of cerebrospinal fluid (CSF) in the ventricles and subaranchonid space (Burger & Scheithauer, 1994). With increased displacement and edema eventually CSF pressure begins to rise. Compression effects are thus exerted on midline structures as well as on contralateral brain tissue. If the brain becomes sufficiently swollen and displaced herniation may result. Cognitive Abnormalities. As the tumor enlarges and intracranial pressure rises, often there is a slight bewilderment, slowness in comprehension, or loss of capacity to sustain continuous mental activity, although specific, localized signs of disease are diminished or lacking (Burger & Scheithauer, 1994). There may be a persistent lack of application to the tasks of the day, a slowing of thought processes and reaction time, undue irritability, emotional lability, inertia, faulty insight, forgetfulness, reduced range of mental activity, indifference to common social practices, etc. Also, there may be inordinate drowsiness, apathy, or stoicism which after a few weeks becomes more prominent (Adams & Victor, 2013). With increased developed, when questioned a long pause precedes each reply and the patient may not even bother to reply as if he/she did not hear the question. However, responses are more intelligent than one would expect. Much of the drowsiness, etc. and general restriction of the mental horizon is related to increased intracranial pressure and is unrelated to the site of the lesion. The most frequent initial non-localizing complaints include, headaches, seizures, personality change, weakness, and confusion.Tumor headaches are an early symptom and are reported by approximately a third of all patients. Although not usually well localized they may be bifrontal or located along the vertex of the cranium. Frequently they are moderate to severe in intensity with a deep nonpulsatile quality, and are usually quite variable occurring throughout the day as well as nocturnally (Adams & Victor, 2013). However, they tend to be worse in the morning when the patient first awakens, and may improve if the patient vomits. Tumor headaches are often due to local swelling of tissues and to distortion of blood vessels in and around the tumor. Vomiting occurs in about 1/3 of all tumor patients and accompanies the headache. Vomiting is not related to the ingestion of food but is sometimes due to increased intracranial pressure, brainstem compression, and is found with tumors of the posterior fossa or with low brainstem gliomas. Generalized epileptiform convulsions are a common symptom of tumor and may precede other disturbances by many years (Gloor, 2017; Kotagal & Luders, 2013). A seizure is the first symptom in 30-50% of all tumor patients, particularly those suffering from astrocytoma, meningioma, or glioblastoma. Indeed, the occurence of a seizure for the first time during adult years and the existence of a localizing aura almost always suggest tumor. Glioblastomas, multiforme, oligodendroglioma, ependymoa, metastatic carcinoma, and primary retuculum cell sarcoma are all associated with the development of seizures. Similarly, tumors of the frontal and temporal lobes frequently trigger seizure activity (Gloor, 2017; Kotagal & Luders, 2013; Trimble, 1996). Depending on which quadrant of the frontal lobes are involved symptoms associated with neoplastic growth can be quite variable. Regardless of location patients tend to complain of headache even during the early stages of tumor formation. In the later stages papilloedema and frequent vomiting are characteristic --features which are usually due to increased intracranial pressure. If the tumor is within the midline region, apathy, mutism, depressive and catatonic-like features with posturing, grasp reflexes, and gegenhalten may be prominent. Some patients are initially misdiagnosed as depressed. Downward pressure on the olfactory nerve may lead to anosmia on the side of the lesion. Pressure on the corticospinal fibers may lead to contralateral weakness, most marked in face and tongue. If the tumor extends to the medial motor areas the patient lower extremity may become paralyzed. Depressive-like symptoms, disturbances of speech output, as well as some degree of motor impairment are also characteristic of left frontal tumors. In contrast, right frontal tumors may initially give rise to manic and delusional symptoms. In general, however, a progressive dementia becomes increasingly apparent regardless of which quadrant has been most compromised. Fifty percent of all patients with frontal tumors are likely to develop seizures. Tumors of the motor areas are easy to localize due to focal convulsions in select body regions. Depending on the extensiveness of the tumor, weakness or paralysis may variably involve the fingers, hand, arm, tongue, face, and trunk. Motor weakness is the result of destruction of cortico-spinal tract fibers (Burger & Scheithauer, 1994). Tumors of temporal lobe can cause receptive and fluent aphasia (if the left temporal region is involved), receptive amusia and agnosia for environmental and emotional sounds (if the right lobe is compromised) and visual field defects, i.e. a crossed upper quadrantic hemianopia with loss greatest in the ipsilateral field. These tumors also cause auditory hallucinations and tinnitus. If the inferior regions are involved, there is an increased likelihood of seizures (in over 50% of all cases), emotional alterations, and disruptions of memory. 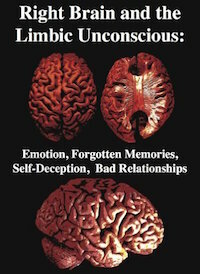 Like frontal lobe tumors, personality changes may be the most prominent symptom. 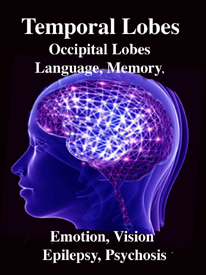 With tumors involving the parietal lobes, sensory disturbances are most prominent. They also may cause sensory Jacksonian fits which consist of paresthesia, tingling, pain, or sensations of electric shock which correspond to the focus of damage. That is, a patient may feel spams of shock-like sensations along her leg. Abnormalities involving the spatial and discriminative aspects of sensation may be prominent (e.g. astereognosis), especially of postural sensibility and tactile discrimination, while crude appreciation of pain, heat, cold is intact. Parietal postcentral tumors are also associated with hypotonia and wasting of the various body parts (parietal wasting). 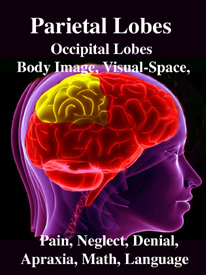 Tumors of the occipital lobe are not as common as frontal and temporal neoplasm or parietal tumors. However, visual abnormalities, including blindness if the tumor is situated medially, are common sequela. Brainstem tumors are more frequent in children than adults (Packer, 2013). In 90% of all reported cases the initial manifestation of a brainstem tumor is a palsy of one or more cranial nerves, most often the 6th and 7th such that conjugate gaze, gaze deviation, and facial sensation are abnormal. In addition, patients develop hemiparesis, unilateral ataxia of gait, and paraparesis. If the tumor increasingly involves the medulla, patients may develop uncontrollable hiccups, and disturbances of cardiac and respiratory rate (Adams & Victor 2013). Death likely as even very small tumors exert drastic effects (Packer et al. 1991). According to Packer (2013, p. 423), "more than 90% of patients will die from progressive disease within 18 months of diagnosis." However, tumors in children arising in the brainstem-cervicle junction are much more amenable to treatment and demonstrate good-quality longer term survival (Robertson et al. 1994). Indeed, in general focal tumors are more easily and successfully treated than diffuse tumors. 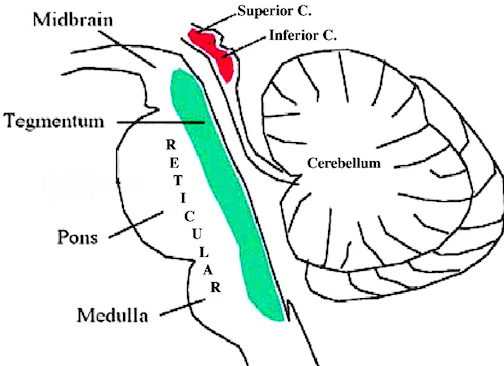 The cerebellum is a common site of tumor, especially in childhood (Burger & Scheithauer, 1994). Symptoms are most marked on standing and walking, such that patients tends to fall backwards or sometimes forwards. Gait is ataxic and nystagmus may be present if the tumors is laterally placed, or absent if localized to the midline. Patients tend to walk with a wide based gait and have much difficulty with balance. Many patients will list to the side of the tumor. Cerebellar tumor growth, via compression, also tends to affect cranial nerves 5-12. Ependymomas originate from the dedifferentiation of adult ependymal cells which line the ventricular walls (Burger & Scheithauer, 1994). The fourth ventricle is involved about 70% of the time. These tumors usually develop in young adults and especially children such that about 40% occur during the first year of life and 75% during the first decade. Presumably these tumors are benign. However, as they can occlude the ventricles CSF flow may be impeded and hydrocephalus and increased intracranial pressure may result. With increased pressure there is a danger of herniation and brainstem compression accompanied by paroxysmal headaches, vomiting, difficulty swallowing, paresthesias of the extremities, abdominal pain, and vertigo. Seizures occur in 1/3 of most cases. Among infants and young children initial symptoms include headaches, lethargy, stupor, spastic weakness of the legs, unsteadyness of gait. In some respects the symptoms are similar to medulloblastoma. The five year survival rate is about 50% (Bloom, 2009; Burger & Scheithauer, 1994). Although these tumors form in the walls of the ventricle thay can also grow into the brain. Moreover, they tend to form miniture ventricles; i.e. tubules of cells which are compacted in a radial manner like spokes in a wheel such that a central cavity is formed. Usually a small blood vessel forms the hub at the center. Medulloblastoma is a rapidly growing embryonic neuroectodermal tumor which arises in the neuroepithelial roof of the 4th ventricle and posterior part of the cerebellar vermis (Allen et al. 2009; Burger & Scheithauer, 1994). Seedings of the tumor may be seen on the walls of the 3rd and laterial ventricles, on the meningeal surfaces, and may metastasize into the spinal canal or supratentorial region (Allen & Epstein, 2012). It occurs most frequently in chidlren aged 4 to 8 with males outnumbering females 3:2. Symptoms associated with medulloblastomas, however, may not become manifest until the patient reaches their early 20s. Symptoms are usually present for 1 to 5 months before diagnosis. Children with these tumors characteristically becomes listless, vomit repeatedly, and suffer early morning headache. Because of cerebellar involvement patients develop a stumbling gait and frequently fall. Exam will reveal papilledema (Burger & Scheithauer, 1994). If the tumor grows unchecked there is danger of cerebellar herniation. As this develops patients may tend to hold their head tilted at an angle, the occiput being tilted back and away from the side of tumor. The five year suvival of patients who have been treated is about 50% (Allen, et al. 2009; Berry, Jenkin, Keen, et al. 2003). The risk of recurrence is limited to the first 3 years after treatment (Bloom, 2009; Burger & Scheithauer, 1994). TUMORS OF THE PINEAL GLAND: PINEALMOMAS. The germinoma which makes up more than 1/2 of all pineal tumors is a firm, discrete mass that reaches up to 3-4 cm in diameter (Burger & Scheithauer, 1994). 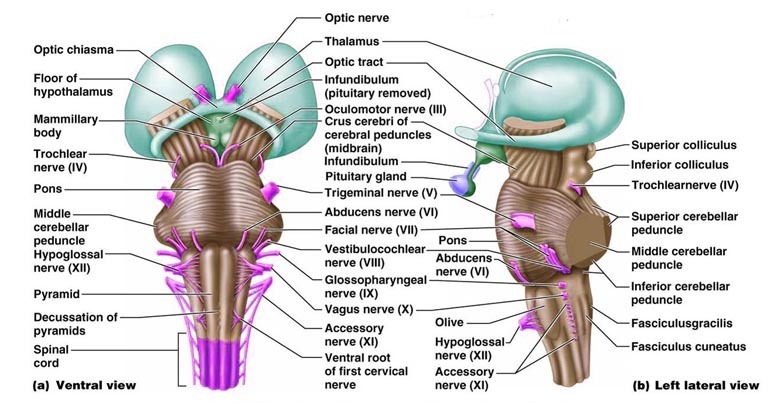 Although its effects on the pineal body are benign, it tends to compress the superior colliculi (thus causing visual and visual attentional disturbances) and sometimes the superior surface of the cerrebellum and narrows the aqueduct of Sylvious. When these later regions are involved, gait and brainstem abnormalities may arise as well as hydrocephalus. Moreover, often these tumors expand into the 3rd ventricle and may compress the hypothalamus (Burger & Scheithauer, 1994). This can give rise to extreme changes in emotionality as well as exert profound disturbances on neuroendocrine and hormonal functioning. Children, adolescents, and young adult males are most often effected as these tumors rarely develop after age 30. Most characteristic localizing symptoms are an inability to look upwards (Parinauds syndrome) and slightly dilated pupils which react to accomodation but not to light. 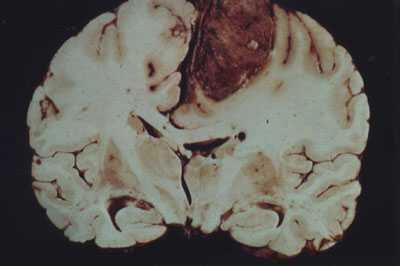 MIDBRAIN TUMORS. Tumor of the midbrain usually cause internal hydrocephalus due to cerebral acqueduct obstruction, and may led to headache, pappilloedema and vomiting. Ocular abnormalities are prominent including weakness of upward conjugate deviation. Pupils are unequal and tend to be dilated, and reactions to light and convergence-accomodation may be lost. Corticospinal tracts are involved on both sides although asymmetrically such that the extremities become weak and possibly paralyzed. PITUITARY TUMORS. Pituitary tumors (e.g. pituitary adenomas) typically produce a variety of symptoms as abnormalities of this gland frequently cause hyper- or hyposecretion and other endocrine changes. These include acromegaly, pituitary giantism, depression of sexual functioning, personality changes, and hypercortisolism. Overgrowth of bones may be evident in the skull, face and mandible and the hands may become broad and spade-like. The patient (particularly men) may also experiences changes in the texture of the skin such that it becomes soft and pliable. There may also be a loss of hair over the body such that in the extreme patients may no longer need to shave (Adams & Victor, 2013). 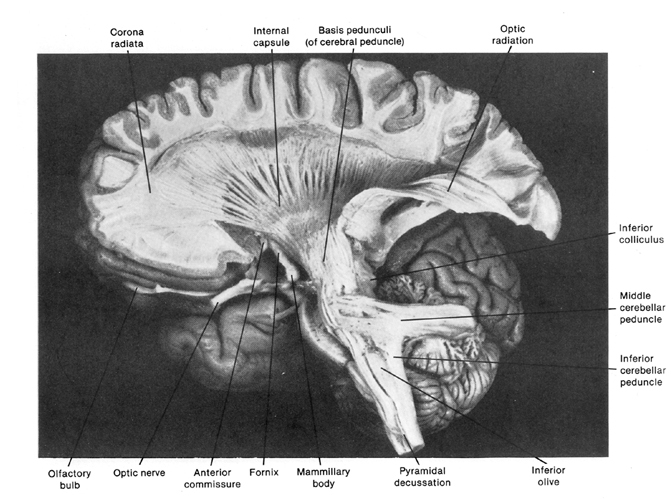 In that the optic nerves and chiasm pass directly beneath the pituitary, tumors in this vicinity often disrupt visual functioning via compression (Burger & Scheithauer, 1994). These visual changes may range from a loss of visual acuity to an progressive narrowing of the visual fields, i.e., tunnel vision. As these tumors expand they can also displace and compress the carotid arteries and thus cause ischemic conditions throughout the brain. Frequently these tumors spontaneously hemorrhage and in fact carry the highest risk for hemorrhage of all intracranial neoplasms. Nevertheless, there are a variety of pituitary tumors each of which give rise to specific hypersecretory products (Burger & Scheithauer, 1994). These include prolactin secreting adenomas which in turn can cause amenorrhea and infertility; growth hormone secreting adneomas which give rise to giantism and acromegaly; adrenocorticortorpic homrone secreting adenomas which are responsible for producing Cushing syndrome; and oncocytomas which are nonsecreting pituitary tumors (Salcman, 2009). Oncocytomas make their presence known via pituitary hypofunction. The annual incidence of pituitary tumor is 1.0 per 100,000 individuals. However, there is an increased risk of developing a pituitary adenomas as patients grow older and women are more at risk than men. For example, among women between the ages of 15 and 44, the incidence is 7.1 per 100,000 (Salcman, 2009). These tumors are also associated with "icecream cone" headaches in which the apex of pain points downwards toward the center of the head. 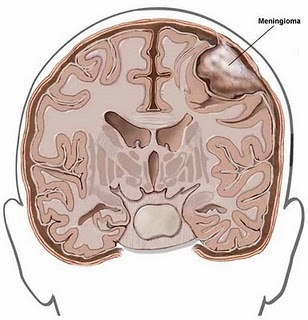 TUMORS OF THE MENINGES: MENINGIOMA. Meningiomas are tumors of the dura mater and/or arachnoid, and arise from abnormal arachonoidal cells of the arachnoid villae (Burger & Scheithauer, 1994). They comprise 15% of all extracranial tumors. However, the risk for developing a meningioma increases with age. Individuals in their 70s have the highest incidence of all age groups. They also occur twice as often among women as men. Indeed, portions of these tumors actually contain estrogen and progesterone receptors (Salcman & Kaplan, 2009). Women with breast cancer appear to have the highest risk of all. These tumors are very slow growing and can become extremely immense before giving rise to symptoms. Although considered benign, they can kill and cause extensive damage via pressure effects. They also can form metastic deposits which infiltrate and invade other organs such as the liver and lungs. Indeed, they may invade the sagital sinus, envelop the carotid arteries, or even erode through the skull (Salcman & Kaplan, 2009). Nevertheless, although originating within the meninges, via compression and infiltration they exert their predominant disruptive effects on the surface of the cerebral hemispheres, the base of the skull, as well as within regions where the dura forms tentorial compartments. They occur most often along the sylvian region, superior parasagital surface of the frontal and parietal lobes, the olfactory grooves, sphenoid bones, superior surface of the cerebellum, and spinal canal (Burger & Scheithauer, 1994). Like many tumors their initial development may not cause any symptoms particularly in that they are very slow growing. Nevertheless, focal seizures are often an early sign. Patients may also develop focal neurological deficits such as motor weakness with frontal involvement, gait disturbances if the cerebellum is involved, or somesthetic abnormalities with parietal invasion. The survival of patients with meningeal tumors tends to be directly correlated with the extent of surgical resection. Unfortunately, incompletely removed meningiomas tend to regrow over a period of 5-10 years. In fact, they may reconstitute from what seems to be very tiny amounts of residual tumor. Nevertheless, 90% of those who have had the tumor surgically resected (and who survived the intial surgery) are alive after five years (Salcman & Kaplan, 2009). Schwannomas and neuromas are tumors of the cranial nerves, usually the 8th, 5th, 9th, and 1st. They are thought to be benign and develop from the schwann cells which cover the cranial nerves. Acoustic (8th nerve) neuromas (Which are essentially a schwannoma) are the most common type (Burger & Scheithauer, 1994). These tumors usually have their onset at an early age. However, the highest incidence is during the 5th decade. Acoustic neuroma occurs occasionally as part of neurofibromatosis, and may be bilateral, and combined with multiple meningiomas. It originates in the junction between the nerve root and medulla, i.e. at the point where axons become enveloped in Schwann cells. 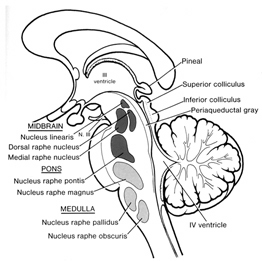 Acoustic neuromas also attack the vestibular division of the 8th nerve just within the internal auditory canal. 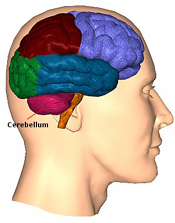 As it grows it increasingly occupies the angle between the cerebellum and pons, i.e. the posterior fossa; and may compress the 5th, 7th and 9th or 10th nerves. With increased growth these tumors come to compress the pons and lateral medula and obstruct CSF circulation (Burger & Scheithauer, 1994). The earliest signs are loss of hearing, headache, disturbed sense of balance, unsteadiness of gait, and facial pain. Approximately a third of patients affected are troubled by vertigo associated with nausea, vomiting, and pressure in the ear. Glia (or nerve "glue") serve a variety of complex functions including providing nutrients to neurons, aiding in the synthesis and removal of neurotransmitters, maintaining synapses, as well as creating the myelin coat which promotes neuronal transmission. In the developing organism, glia acts to direct embryonic and migrating neurons to their target cells. Broadly, there are several types of glia, including Schwann cells which are found the in peripheral nervous system, and micro and macroglia which are found in the spinal cord and throughout the cerebrum. Microglia serve, in part, as the brain's immune system, whereas macroglia aid in neuronal intercommunication. Macroglia subtypes include astrocytes and the oligodendrocytes which make up the myelin sheath. Unfortunately, glia, specifically unchecked glia growth and proliferation, are a primary source of brain tumors. Astrocytomas are the most frequently occuring type of tumor and arise from the dediffentiation of astrocytes which have lost their abilty to limit their own replication (Burger & Scheithauer, 1994; Salcman & Kaplan, 2009). Although the abnormal cells themselves are not as numerous as what constitutes a higher grade glioblastoma these tumors tend to be evenly distributed and infiltrate a wide zone of tissue. Indeed, they frequently infiltrate and entrap normal neurons and glia (Burger, 2009; Burger & Scheithauer, 1994) and may occur anywhere in the brain or spinal cord. Astrocytomas are slowly growing tumors which infiltrates and form large cavities in the regions occupied. 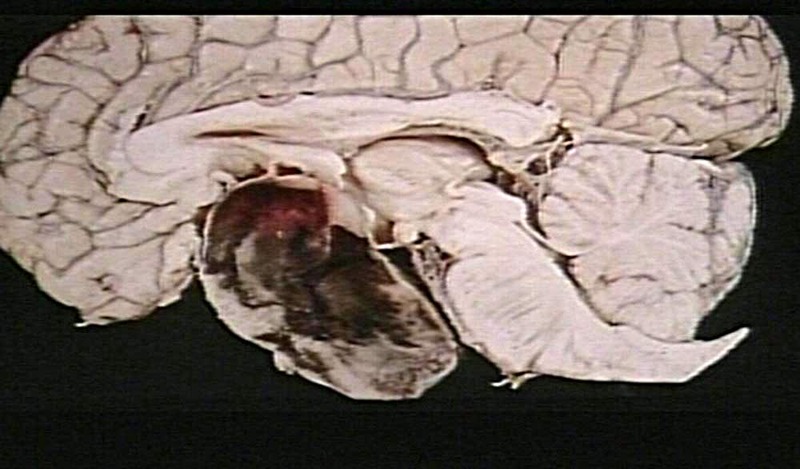 Some are noncavitating and form in the white matter. Sometimes these tumors form micrcysts (Kepes, 1987). If several tumors are adjacent these micrycsts can coalesce to form larger cysts. GRADING These tumors are usually graded on a 4 point scale depending on there degree of differntation; grade 1 being the most benign and the smallest. Typically grade 1 astroytomas contain normal as well as abnormal astroycytes, and they tend to be well differentiated. They are apparently quite difficulty to detect on gross inspection. Grade 2 represents an increased density of abnormal cells as well as reduced differentation. Both grade 1 and 2 astrocytomas are often referred to as low grade gliomas. PREFERENTIAL REGIONS OF FORMATION. In general, astroycytomas occur most frequently along the frontal-temporal convexity (Burger & Scheithauer, 1994; Salcman & Kaplan, 2009)--areas which are most susceptible to contusion following head injury or acceleation-rotational traumas. In fact, grade 1 astrocytomas structurally and metabolically resemble a normal astroyctic reaction to an injury (Salcman & Kaplan, 2009). Indeed it appears that some individuals develop these tumors only after a head injury. Presumably the head injury acts as the environmental event which interacts with a genetic predisposition so as to trigger tumor formation. Nevertheless, they also tend to grow almost anywhere within the cerebrum, including the cerebellum, hypothalamus, pons, optic nerve and chiasm. Alrthough considered relatively benign, as these tumors grow they can initially give rise to focal neurological deficits, may distort the lateral and third ventricle, displace the anterior and cerebral arteries as give rise to seizures. Fifty percent of patients present with initial focal or generalized seizure, and many of these individuals continue to have recurrent seizure throughout the illness. Headache and signs of increased intracranial pressure occur late. Age of onset is 20-60 years. MORTALITY & MALIGNANCY. These tumors are relatively dangerous and are associated with a high mortality rate, 50% dying over the course of the first five years (Salcman & Kaplan, 2009). In addition, although initally a grade 1 or 2, it appears that as patients age these initially slow growing astrocytomas become less well differentiated and possibly progress to a more rapidly growing grade 3 or 4 tumor (Berger, 2009). Grade 3 and 4 astrocytomas are also referred to as gliomas. For example, the probability that an astroyctoma is malignant is less than 0.35, among individuals below age 45, whereas after age 60 it increases to 0.85. In this regard, as age increases, the likelyhood of suffering a malignant astroycytoma (i.e. glioma) increases. Moreover, many malignant gliomas contain fields of benign tumor which further suggest that astrocytomas progress from a slowly growing benign neoplasm to a rapidly growing malignant tumor (Shapiro & Shapiro, 2009). Grade 3 lesions are very densely packed, are less well differentiated, contain necrotic tissue, and are very malignant. Sometimes they are accompanied by small areas of hemorrhage. These cells also tend to develop and divide much more rapidly than normal cells (Nelson, et al. 2009). Patients who develop higher graded gliomas are older than those with the lower grade astroytoma and typically become or have been symptomatic for a shorter time period before coming to the attention of a physician, i.e. on the average of 5.4 months vs. 15.7 months (Burger, 2009). Of course, glioblastomas grow at a much more rapid pace (Burger & Scheithauer, 1994). They have their peak incidence between the ages of 40-60 and occur among males more frequently than females (Ronsohoff, et al. 2009). Moreover, these tumors are associated with HIV and those infected with HIV have a higher incidence of brain tumor, glioblastoma multiforme in particular (Blumenthal et al., 2013). The 18 month survival of patients with glioblastoma is is anywhere from 15-30% (Burger, 2009; Shapiror, 2009b). In part, the grim outlook for these patients is due to the development of local disease (Gaya, 2009; Nelson, Urtasun, Saunders, et al. 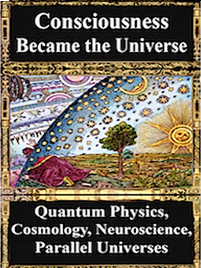 2009), as well as their potential for rapidly infiltrating wide regions of the cerebrum. Grade 4 astrocytomas are an extremely malignant form of neoplasm and are commonly referred to as glioblastoma multiforme. Some have argued, however, that grade 3 and 4 gliomas sould be considered one and the same (Burger, 2009) and that grading should be based on a 3 rather than a 4 point scale. Glioblastoma multiforme accounts for about 20% of all intracranial neoplasms, for about 55% of all glioma tumors, and for 90% of the gliomas of the adult cerebral hemisphere. As the name implies, a glioblastoma multiforme is highly dedifferentiated consisting of multiple cells types intermingled among others with various consistencies, cytoplasmic contents, colors, textures, and atypical nuclei (Shapiro et al. 1981). These tumors also contain large ares of necrosis (surrounded in a "picket fence" manner by astrocytic nuclei). In addition, they are heavily vascularized and considerable abnormal capillary proliferation occurs in association with these tumors. Many of these capillaries also have vessel walls which demonstrate endothelial hyperplasia. Hence, there is a tendency for these tumors to spontaneously hemorrhage (Laurent et al. 1981). These tumors also have a tendency to develop predominantly within the frontal-temporal regions (Burger, 2009; Burger & Scheithauer, 1994; Salcman & Kaplan, 2009). However, they are very rapidly growing and tend to be multifocal. If allowed to run their course, they will freely infiltrate the cerebrum, brainstem, spinal cord and cerebellum, and will extend into the opposite cerebral hemisphere. About 50% are bilateral or occupy more than one lobe of a hemisphere (Burger & Scheithauer, 1994). Even when unilateral, midline structures are often compressed, and the lateral ventricles distorted and displaced contralateraly. In addition, they may attain enormous size before attracting medical attention. These tumors are thus very dangerous and also very resistant to treatment due to their cellular, metabolic, vascular and chromosomal diversity (Shapiro & Shapiro, 2009). Indeed, the central portion of the tumor (which contains areas of necrosis and cells which are hypoxic but viable), is highly resistant to radiation and chemotherapy (Salcman et al. 2012). This is because of their reduced blood flow which in turn impedes the ability to treat them chemically. Moreover, because they are hypoxic they are more resistant to radiation than well-oxygenated cells (Nelson et al., 2009). Because the tumor is multicentric it is impossible to remove completely (Burger & Scheithauer, 1994). In addition, even following resection and chemo-radiation therapy, recurrence usually occurs within 1 year (Burger, 2009). It will often revert back to its original size and distribution. Unfortunately, even among patients who survive, the long-term effects of treatment are associated with progressive cerebral atrophy and deterioration of cognitive capabiity (Burger, 2009; Ransohoff et al. 2009). Thus the outlook for patients with this form of tumor is extremely grim. Less than 20% of adults will survive one year. Among children, 50% will die within 18 months, and only 25% survive five years (Allen, et al. 2009). Peak incidence, however, is during middle life. These tumors are said to have a "fried egg" appearance and are not typically graded. They arise due to the dedifferentiation of oliogodendrocytes--the cells which form myelin. Oligodendroglioma occur most commonly in the deep white matter of the frontal and temporal lobes with little or no surrounding edema. The tumor is slow growing, and the first symptom in 50% of patients is a focal or generalized seizure. These have a tendency to calcify. Lymphomas are tumors which are composed of cells that reside in the lymph nodes, i.e. lymphocytes, lymphoblasts, histocytes, and reticulum cells (Burger & Scheithauer, 1994). These tumors often develop preferentially within the adventitial spaces of the blood vessels (Kepes, 1987), and have also been refered to as reticulum cell sarcoma (Portlock, 2009). 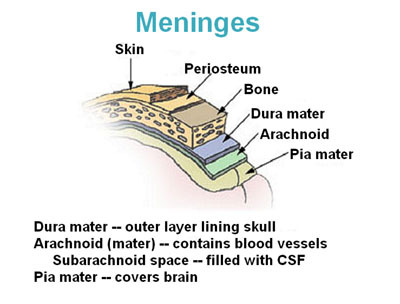 They also develop within the meninges (Lister, Sutcliffe, Brearley & Cullen, 2009: Portlock, 2009) and are sometimes due to bone marrow disease (Young, Howser, Anderson, Jaffe & De Vita, 2009). However, lesions are often multifocal and may extend into the basal ganglia, thalamus, and coprus callosum (Portlock, 2009). Lymphomas occur most commonly among individuals in their 50s. However, they have been known to affect infants as young as 16 days of age (Portlock, 2009). Symptoms develop quite rapidly and death ensues quite quickly, many dying in the first 13 months but a few living as long as 31/2 years (Portlock, 2009). Sacrcomas are malignant tumors composed of cells derived from mesenchymal tissues (fibroblasts, lipocytes, osteoblasts), and are rare. Many occur within the cranial cavity, or the temporal-frontal-basal regions during the 5th to 6th decade (Burger & Scheithauer, 1994). Neuroblastomas are tumors that occur predominantly among young children, infants, and even neonates (Burger & Scheithauer, 1994; Pochedly, 2006). They arise from sympathetic nervous tissue from any region of the body. 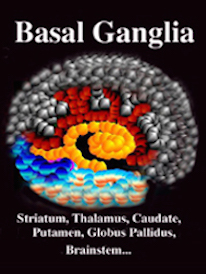 Within the brain they originate in the sympathetic ganglia or the adrenal medulla (Burger & Scheithauer, 1994). Their effects on the brain are due primarily to compression although they have a tendency to infiltrate the meninges and venous sinus. Usually, however, they infiltrate the cranium causing destrucution and widening of the sutures, as well as the meninges, particularly the dura behind the orbit of the eyes and at the base of the brain (Pochedly, 2006). Its major effects are due to compression and increases in intracranial pressure. Cysts are pesudotumors that simulate intracranial neoplasm. They are usually found overlying the sylvian fissure or the cerebral convexity and may develop within the ventricular system. Sometimes, however, tumors will calcify and/or coalesce so as to form cysts. Colloid cysts are congenital, but do not usually exert significant effects until adulthood when they begin to compress and/or obstruct the 3rd ventricle thus producing obstructive hydrocephalus. In general, as a tumor grows it will exert pressure on underlying structures, and with sufficient development will not only compress but cause shifting of the brain such that subcortical and contralateral brain tissue becomes dysfunctional. In some cases, during the early stages of tumor growth patients may complain or demonstrate symptoms which seem to suggest bilateral lesions. If the tumor is too small to be visualized by CT-scan or MRI, the bilateral nature of the patients deficits (which might only be detected by a competent neuropsychologist) may seem paradoxical. As noted, neoplasms utilize less oxygen and have a lower blood flow as compared to normal tissue. However, due possibly to the effects of compression or bilateral arterial adjustments to localized blood flow reductions, cerebral tissue contralateral to the tumor also demonstrates lower than normal oxygen utilization and blood flow (Beaney et al. 2005). This in turn depresses the functioning of this otherwise normal tissue. However, with treatment of the tumor, blood flow returns to normal in this contralateral region (Brooks, et al. 2009). Hence, in some respects a tumor can exert both localized as well as seemingly paradoxical contralateral disruptive influences. Thus a patient with a tumor of the right motor strip may display not only unilateral left sided weakness or paresis, but clouding of consciousness, confusion, depressive-like emotional changes and expressive language difficulties (due to contralateral compression and hypoxia). With the formation of a neoplasmic growth, local tissue becomes depressed, the development of edema is incited, the brain begins to swell, and the volume of the intracranial contents is increased (Fisher 1995). When brain tissue swells, midline structures shift and become compressed, the lumen of the affected veins and capillaries collapse, as does the ventricles, sulci, and subarchnoid space of the swollen hemisphere. If intracranial pressure is raised sufficiently, the brain not only shifts, but the midbrain and brainstem may become compressed (Fisher 1995) interfering with life sustaining functions of respiration, blood pressure control, and temperature regulation. The first compensation for increased pressure depends on the two rapidly mobile intracranial fluid pools, the CSF and intra-vascular blood. If the hemispheres swelling exceeds the compensatory mechanisms, the only escape for the displaced hemisphere is to herniate. The manner in which herniation occurs is dependent on the location of the tumor. For example, frontal or parietal tumors tend to induce herniation medially under the falx cerebrei which separates the two hemispheres (subfalcial herniation). With subfalcial herniation the medial part of one frontal or parietal lobe is pushed under the falx damaging not only these regions but the cingulate gyrus. Temporal lobe tumors induce downward herniation over the edge of the tentorial notch which surround the mescencephalon (transtentorial or temporal lobe herniation). 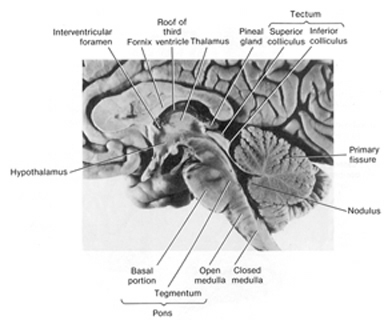 That is, the medial portion of the temporal lobe is forced into the oval-shaped tentorial opening through which the midbrain and subthalamus pass, pushing these structures to the opposite side and thus exerting great pressure on them and their vessels. This results in a hemiparesis due to compression of the cerebral peduncle, which is ipsilateral to the lesion. 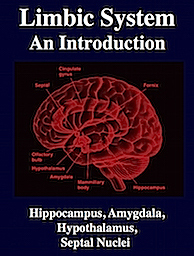 In addition, the medial aspects of the temporal lobe including the amygdala and hippocampus become seriously compromised. Transtentorial herniation may be bilateral if there are multiple neoplasms. 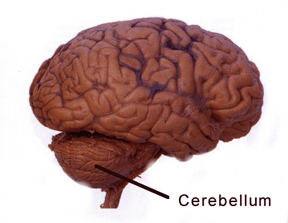 Tumors which have invaded the cerebellum are likely to cause cerebellar herniation. This also results in brainstem compression as the cerebellum is forced down in the foramen magnum. As transtentorial herniation increases, the uncus displaces the posterior cerebral artery and the 3rd nerve which in turn causes the pupil to constrict. Eventually both 3rd nerves may cease to function, and both pupils become dilated and fixed--no longer responding to light. Decerebrate rigidity is a postural syndrome of transtentorial herniation. The mouth is closed, the wrists, fingers and toes are flexed, with the head, trunk, arms and legs extended with hands and feet internally rotated. Breathing also becomes irregular and shallow. Appearance of this syndrome requires transection/compression of the mesencephalon and sparing of the vestibulospinal tract and dorsal/ventral roots as well as brainstem compression. 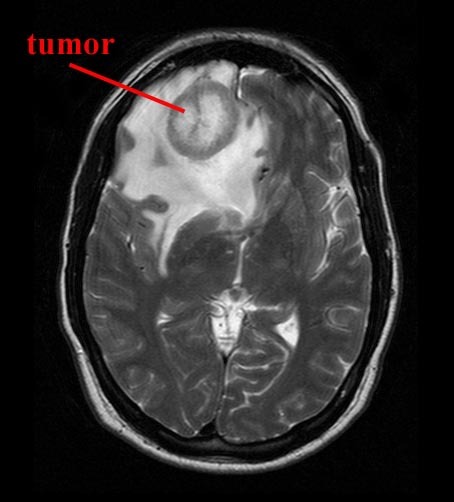 Tumors most likely to cause increased intracranial pressure without conspicuous focal or lateralizing signs are: medullablastoma, ependymoma of 4th ventricle, glioblastoma of the cerebellum, and colloid cysts of the 3rd ventricle. 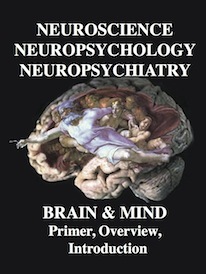 It is noteworthy that in a recent review that Fisher (1995, p. 83) argues that temporal lobe herniation is not the means by which the midbrain sustains irreversible damage in acute cases, but rather th later displacement of the brain at the tentorium is the prime mover and herniation a harmless accompaniness... (and that)... bilateral brain stem compression is acute bilateral cases must be distinguished from herniation." Major prognostic indicators regarding so called malignant neoplasms are the age at time of diagnosis, Karnofsky performance score (a measure of quality of life), the presence or seizures, tumor pathology, e.g. anaplastic astroycytoma vs. globlastoma multiforme, and even blood type (Burger & Scheithauer, 1994; Green et al. 2003; Shapiro, 2009b, 2013). Hence, young patients live longer than older individuals --the death rate for those under 45 being 1/3 that of those over 65; those with type B or O blood have a better prognosis than those with A or B; and individuals who have developed seizures are more likely to survive than those who have not. In fact the longer they have had seizures the longer is the survival time (Shapiro, 2009b). However, as noted, children between the ages of 3 and 5, diagnosed with medullablostomas, have a very poor survival rate (Packer, 2013). Those with brainstem tumors, gliomas in particular, have a survival rate of only about 10%. Some researchers have noted that preoperative tumor size is strongly related to survival (Andreou, et al. 2003), whereas other have not noted a strong relationship. Nevertheless, it has consistently been noted that the smaller the residual tumor following surgery, the longer the patient will live (Andreou et al., 2003; Salcman, 2005; Shapiro, 2013; Wood, Green & Shapiro, 1988). Unfortunately, total resection is quite difficult in that it is not practical or ethical to remove a sufficient quantity of normal tissue so as to insure total removal and thus total elimination. Hence, given the infiltrative and regenerative abilities of most tumors, recurrence is likely. Indeed, tumors often recur adjacent to their original site. Moreover, combined resection and chemo therapy is not always successful due to the protective influences of the blood brain barrier (Blasberg & Groothuis, 2009; Shapiro, 2013; Shapiro & Shapiro, 2009). It is this same blood brain barrier which protects the tumor from the antigens of the immune system --a functional result of the relative absence of vesicular transport across the endothelial cytoplasm between the tightly spaced capillary endothelial cells. Fortunately, as new methods of therapy are discovered and employed, and with early detection, prognosis for many patients should only improve. On the other hand, as the rate of brain tumor infection is rapidly increasing, along with that of secondary cancers (Duffner et al., 1998; Packer, 2013; Smith et al., 1998) the outlook is rather grim (e.g., Shapiro, 2013).